It's true the best stories are found between the pages of a passport. One of the ways to experience a country is through food. Food allows you to experience other cultures and other people’s history. Dishes always have a special story behind them and trying others’ cuisine gives you a firsthand experience into that history. I will be going to Las Vegas for the weekend and the thing I am most excited about is all the amazing food there is. There are not enough shows to watch and blogs to read to prepare me for my two days in Vegas. With so many options, how will I know where to go?! Within the last few months, I traveled to Asia and Australia and I can definitely say I ate my way through both. Prior to going, food wasn’t my biggest priority. I was excited to explore the town, try new things and have a few adventures. I didn’t research the food before going so I didn’t know what to expect but I also had no expectations. After my first trip, which was to Thailand, I have a new-found appreciation for food. Before going anywhere, I research the best places to go and get excited about all the new places I get to try. I can honestly say this has been a result of not only traveling but of eating really good food when I do. The first thing I ate when I arrived in Bangkok was pork that I bought from a woman who had set up a stand and was cooking right outside of our hotel. To this day, it was one of the best pieces of meat I have ever had. After that first experience, I became excited about all the amazing food I was sure to try in Thailand. Bangkok did not disappoint. Between the night markets and street vendors, there was more than I could try in a single trip. During my travels, I have not only eaten amazing food, but I have found new favorite dishes. Now, food is on the list of what I look forward to prior to going somewhere new. Check out my next blog where I plan to write about how traveling changed the way I eat! Please leave your comments and thoughts below. Thanks for reading! My purpose is to live a life that is authentic and genuine. By decluttering my life and focusing more on experiences, I want to be authentic in who I am as a person and the interactions I have with others. I want to live a life that is rich in stories and abundant in good memories. 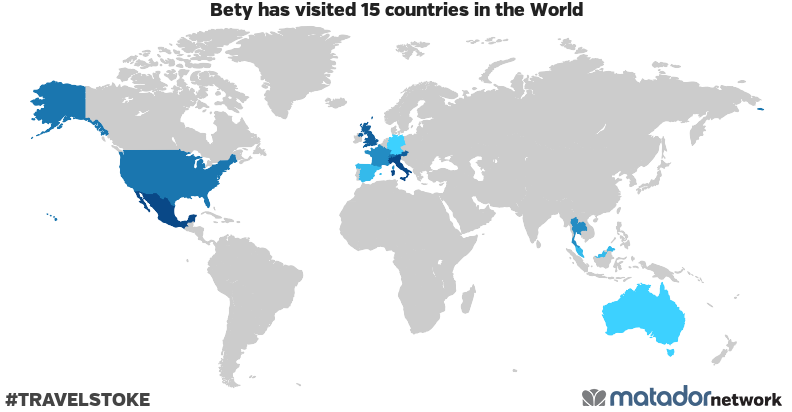 Bety has been to: Australia, Austria, France, Germany, Hong Kong, Italy, Malaysia, Mexico, Singapore, Spain, Switzerland, Thailand, United Kingdom, United States, Vatican.